With a crooked style like something out of a Dr Seuss book or a Tim Burton movie, the 9 x 5 Robin Axi Playhouse is a whole lot of fun. This is such an intriguing playhouse as its design really is unlike anything else, but as well as the interesting look, the playhouse also has a number of features. 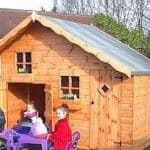 The actual playhouse is an ideal size for smaller kids and they have a little decking area that they can play out on if the weather is good. 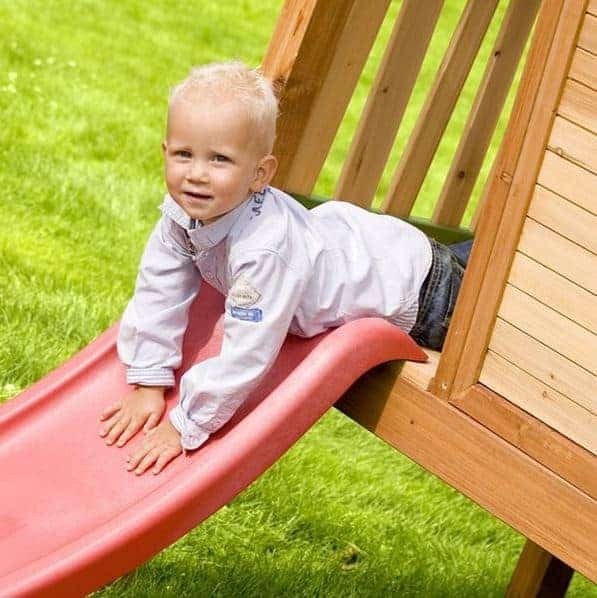 There is a small ladder that features large solid rungs for them to climb and then there is a slide which they will really enjoy going down. In all this is a playhouse that will let them have a whole lot of fun on their own, with their friends or even their teddies. As this is a playhouse made for younger children a lot of work has gone into making sure it can take rough play and also that it will last for a lot of years. A very durable 38 mm thick frame is what is used to keep things all together and in front of this we have some gorgeous, tongue and groove shiplap cladding which on the front is done in a fun, slanted way. This is the type of playhouse that is going to be able to be used for lots of years. 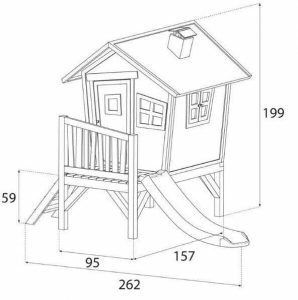 We love the crooked and almost Dr Seuss design of the 9 x 5 Robin Axi Playhouse as it really does set it apart from all the rest. It is not a huge playhouse so do not worry if you have a rather compact garden. The actual width of the structure is 8 feet 7 inches and the depth 5 feet 1 inch. So while there is plenty of room for the children to play, your garden will not be taken over by this. This is a tower playhouse, but it is not that high, making this something that would be suitable for younger children. Actually we feel that this would make for an awesome first playhouse for a child. Axi have made a playhouse that is all about fun, from the fun and quirky look to the actual features. This is a playhouse where the kids are going to have a great time. Let’s start with the ladder which as these nice thick rungs so that it will be easy for the kids to get up and down. The ladder only has three steps so as you can see it really is not all that high. The decking area has a safety railing that the kids can look over and most probably throw their soft toys over as well. The other side has a little slide that is not that steep so you will be happy to let the kids just go up and down it as they please. 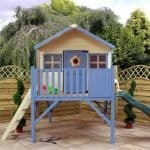 We really like the wooden roof that is on this playhouse, we have actually seen this on a few other playhouses from this manufacturer and we just love how it looks so much more high quality than a roof made with felt. This is an apex roof, but it actually sticks out a few inches on each side so the decking is covered a little bit and so are the windows on the side which is practical and it also looks great. Speaking of looking great as you can see this is a playhouse that certainly has its own style and that goes with the roof as well. they have put this funny, wacky fake chimney on the roof that we really like. All of the walls are made with Asian cedar wood and they are 15 mm thick tongue and groove shiplap cladding. 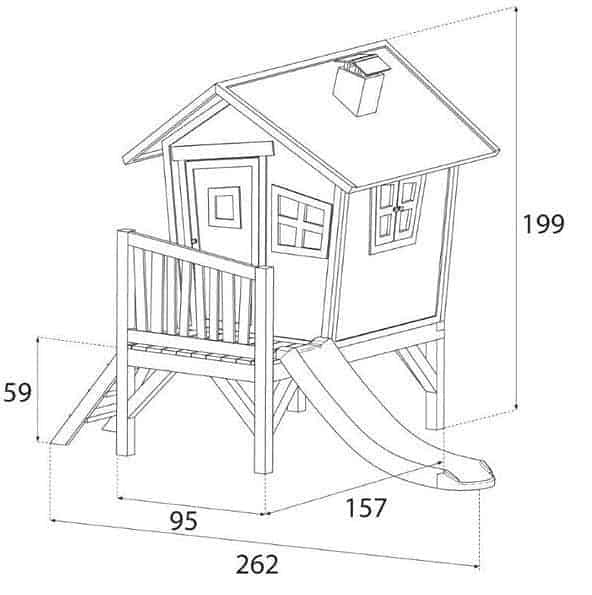 Now at a glance you may think that something is a little off, but actually this is all part of the design of this playhouse. Round the sides the cladding is as you would expect, but on the front in keeping with the crazy and fun design they have actually put this at an angle and it really does look fun, we are sure more than a few people will take a second look at this as they try to get their head round it. A robust 38 mm frame keeps this playhouse together and this is one thing we are thankful they have not given a crooked and weird design. This frame will keep the playhouse very solid and will make sure they are able to enjoy this for a lot of years. Flooring as we are sure you have guessed is just as solid as the rest of the playhouse. If you take a real close look at the picture you can actually see how attractive the flooring on the decking is as it is made with tongue and groove boards. Even the flooring inside is strong and solid and no matter what kinds of dance moves your kids are doing, this floor is able to handle them. We really love the way the Asian cedar woods and to keep that smooth high quality look, you need to treat it rather shortly after you have constructed it. All you need is a fresh coat once a year and this will stay rot free. A five year guarantee is included which will cover you in case of rot. Make sure you look after the wood properly and this guarantee will never need to be used. The 9 x 5 Robin Axi Playhouse has a really awesome door. It has the same crooked style as the rest of the playhouse and it even has the slanted cladding. They have put a small window on the door and even this is done in a wacky style. The door is a good size for younger children and no matter what they are trying to drag through the door they will be able to get it inside. There are a good selection of shatterproof acrylic windows on this playhouse and they have these slanted window frames that give them just a ton of personality. On the front to go with the one on the door there is a fixed window, but the windows on the sides of the playhouse can be actually opened. These have thick frames and are kept closed with magnets which is a really interesting way of keeping them closed. 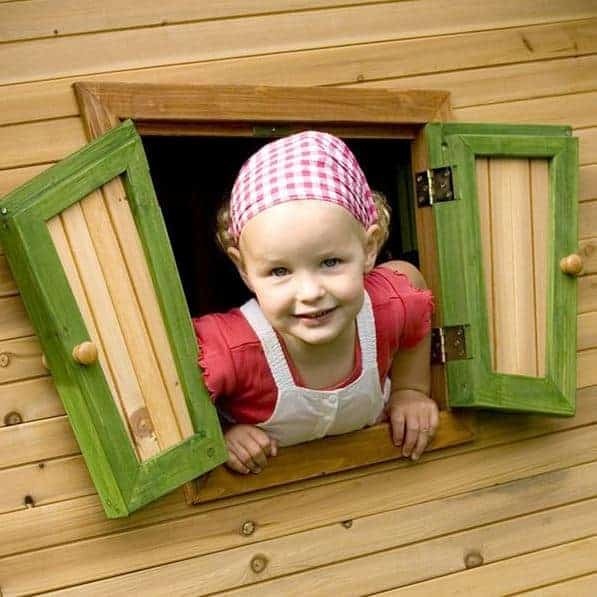 We love how secure and sturdy this playhouse feels and with the door and windows closed it is even more secure. Adding a lock could be done cheaply and easily, but this is not something we would recommend as you want the kids to be able to just come and go as they please without having to get mum or dad to unlock the door. The windows have pretty thick frames so when they are closed they do give the kids quite a bit of privacy. 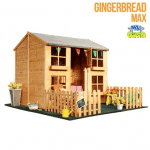 However due to the crazy and fun design, we bet this is a playhouse that not just the kids friends want to check out, but any adults who come round will also want to see it and we bet the kids will love showing off their playhouse. 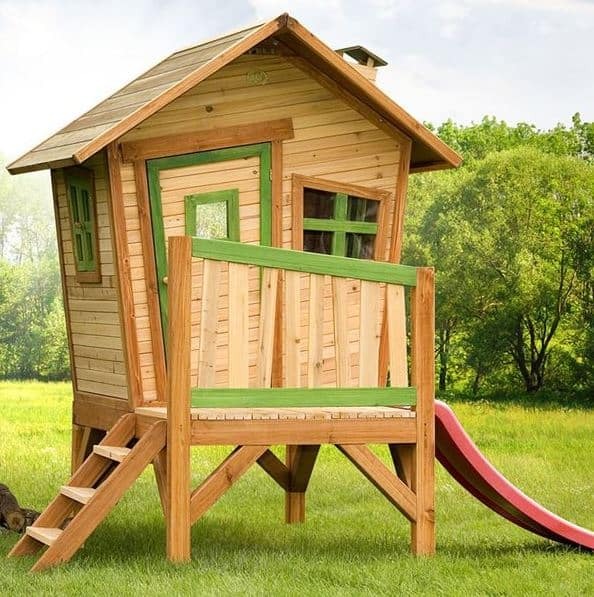 This is an amazing and unique looking playhouse and honestly you really do not want to mess with the design of it, but using a coloured wood treatment to even a couple of different colours could make it look even more fun. 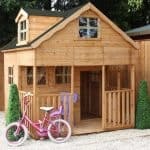 No extras are available with this playhouse which is not a bad thing as there is nothing to tempt you to spend more money. Even though this is a playhouse aimed at younger kids we love how Axi have made this just as high quality as their larger playhouses. This is made so well that we honestly feel that your kids will outgrow it before it starts to show signs of wear and tear from the years of fun they have had with it. This is not a large structure which makes it ideal for smaller gardens, but the actual playhouse is not all that large, but as this is for younger children we are sure there will be plenty of space inside for them. This should be a fairly straight forward, follow the instructions kind of DIY project. With a friend, we think it about 4-6 hours is what it will take to build this. 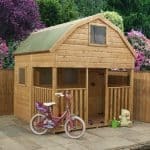 We really like this playhouse and feel that it is offering excellent value for money due to the quality of materials and the unique and kooky design. Final Thoughts: The 9 x 5 Robin Axi Playhouse is a playhouse that will certainly make you look twice with the funky and unique design and just the general charm that it oozes. This really is one of the most eye catching playhouses in this whole line. 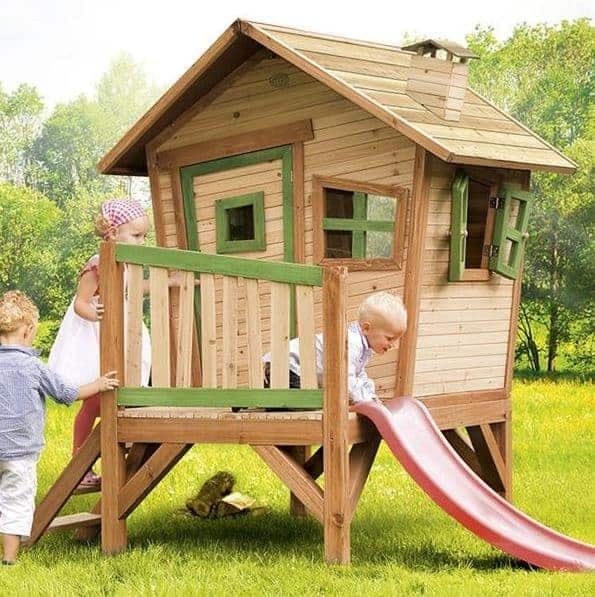 While it is easy to get hung up on the looks, this is still a very fun playhouse with the ladder, slide and the decking area for them to use. We are sure that little boys and girls will have a really awesome time with this and honestly we feel that the price considering the quality and the features it has is very fair. 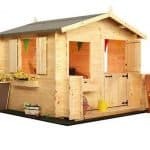 This is a playhouse that we think is just fantastic and suggest you seriously consider.